The chamber orchestra “Cameristi della Scala”, formed by the musicians of the orchestra of Teatro alla Scala di Milano, was founded in 1982. The orchestra has a unique identity in which they regularly perform in the formation with and without a conductor. Its core repertoire includes many masterpieces written for chamber orchestra from the 18th century to the present day, in addition to promoting and championing works by the lesser known Italian composers. Cameristi della Scala often features the section leaders of La Scala orchestra as soloists as well as performs with many well- known instrumentalists and opera singers. Significant artistic influence from celebrated great conductors of the past and present working at Teatro alla Scala contributed to the character and the shape of Cameristi’s musical phrasing blended with distinct Italian sound. Cameristi della Scala has performed in many prestigious venues and concert halls throughout the world. The current 2017-18 Season includes Cameristi’s first tour in India, first appearance in Tunisia as well as performances in the Meisterinterpreten Series in Tonhalle-Maag Zürich, in the Beethovenfest in Bonn, Lisinski Theatre in Zagreb and in the closing concert of Variations Musicales de Tannay in Switzerland. For the Centennial Year of Leonard Bernstein, Cameristi della Scala will perform a special concert commemorating the great musical icon at Teatro alla Scala in May 2018. Together with the celebrated Italian danseur/La Scala principal dancer Roberto Bolle, Cameristi is developing an original project to be performed at 2018 Davos World Economic Forum with further plans beyond for continued collaboration. Rounding off an exciting season, a commission of a new piece written by the composer/cellist Giovanni Sollima will be given its world premiere at Teatro alla Scala by Cameristi. Highlights of Cameristi della Scala’s recent major projects include two concert series at Carnegie Hall in New York, performances in the United Nations Auditorium, the Library of Congress in Washington DC, MIT in Boston, Tchaikovsky Hall in Moscow, Salle Gaveau in Paris, Tonhalle in Zürich, Warsaw Opera Theatre, Teatro Coliseo in Buenos Aires, Sony Center in Toronto, Canary Island Festival as well as international tours to China, Germany, France, Spain, Switzerland, Scandinavia, Eastern Europe and Turkey. During a 2010 tour to Israel, Cameristi had the honour performing at the Mann Auditorium in Tel Aviv and in Expo 2010 Shanghai China, Cameristi della Scala gave four concerts before large audience in Shanghai in the occasion of the city of Milan week. In 2011 Cameristi opened Emilia Romagna Festival in Imola and in collaboration with the Associazione Musica del Risorgimento, Cameristi della Scala performed for the celebration of the 150th anniversary of the establishment of the Kingdom of Italy beside appearing also in MITO SettembreMusica Festival. Between 2007 and 2009 Cameristi della Scala was featured annually in the Grand Summer Concerts in Piazza del Duomo in Milan in front of 20.000 audience. For this summer concert series, a new piece dedicated to the Cathedral of Milan was commissioned and performed each year by Cameristi to an important living Italian composer. Cameristi della Scala received the Premio Isimbardi (Isimbardi Prize) in 2012 from the Province of Milan as a recognition for their outstanding contribution to the community and the prestige of the city of Milan in the world. Following his sensational debut with the orchestra, effective December 2017 the conductor Wilson Hermanto begins his association with Cameristi della Scala as the Principal Guest Conductor. In his new role Maestro Hermanto will work closely with the orchestra to develop future projects internationally. Their next appearance this Season is at Teatro alla Scala in May 2018. Has studied french horn at the “A.Vivaldi” Conservatory of Alessandria with Giacomo Zoppi, composition with Felice Quaranta and orchestra conduction with Igor Markevitch and Franco Ferrara at the Chigiana Academy of Siena. 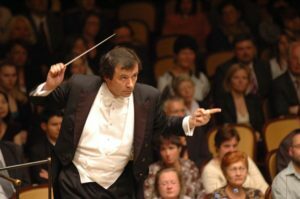 After having debuted with the RAI Symphony Orchestra of Turin, he has conducted repeatedly the San Carlo Orchestra of Naples, the Massimo Theatre Orchestra of Palermo, “Enti Arena” of Verona and Cagliari, the Opera of Genoa, the Philharmonics of Turin, the Italian Philharmonic Orchestra, the Swiss Italian Orchestra, the Staatsoper of Munich, the Nordwestdeutsche Philharmonie, the Baden-Baden Philharmonic, the Galizia Symphony Orchestra, Gran Canaria Philharmonic, The Royal Philharmonic Orchestra, The Moscow Philharmonic, Berliner Philharmonic Orchestra, Deutsche Oper of Berlin and Philharmonic Choir of Prague. Since 1995 he has conducted in concert halls of prestige in all Europe: Concertgebouw of Amsterdam, Musik Halle of Hamburg, Royal Albert Hall of London, Palais des Beaux Arts of Bruxelles and the Elizabeth Halle of Antwerpen, the Philharmonic of Munich, Berlin, Mannheim, Academy of S.Cecilia in Rome, Rome Opera and Comunale of Bologna. In Lebanon, Portugal, Mexico, Chile, Argentine, Brazil, USA, conducting the Philharmonic Orchestra of Xalapa, Symphonic of Chile, Philharmonic of Buenos Aires, Symphonic of Rio de Janeiro, San Diego Symphony,Vancouver Symphony, Hollywood Bowl Orchestra, New Jersey Symphony, Naples Symphony, Hartford Symphony, the National Opera of Beograd, Beograd Philharmonic, Royal Philharmonic in United States, the Estonian National Symphony, British Philharmonic, the BBC Radio Concert Orchestra, the Cairo Symphony, Manila Philharmonic, the Presidential Orchestra of Cremlin, in Australia and New Zealand with the Melbourne Symphony, Sydney Symphony, Adelaide Symphony, Queensland Symphony, Perth Philharmonic, Aukland and New Zealand Philharmonic and in China with the National Opera and Choir of Beijing, Shanghai Symphony and Beijing Symphony Orchestra. Since 2004 he is principal guest conductor of the Czech National Symphony Orchestra of Prague with which he has recently recorded for the Victor-JVC. He conducted in the Scala’s Theatre of Milan in 2006/2007 and 2009. 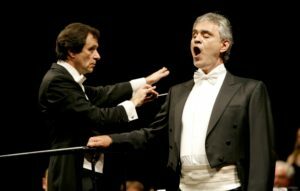 Many are the well known soloists who have been accompanied, like Rostropovic, Geringas, Rampal, Galway, Diaz, Sitkovetsky, Baumann, Cecilia Gasdia, Tiziana Fabbricini, Katia Ricciarelli, Mariella Devia , Maria Dragoni, Kiri Te Kanawa, Renato Bruson , Leo Nucci and Nicola Martinucci.Memorable has been the participation, with Andrea Bocelli and the “Toscanini” Orchestra of Parma at the Bologna concert in the presence of the Pope John Paul II broadcast in worldvision. Large is the opera repertoire with over forty titles performed and particular attention for Rossini, Bellini, Donizetti, Verdi and Puccini, whose operas he has conducted earning success of audience and critique. Nato e diplomatosi a Bari, Michele Govi è stato vincitore di concorsi come “Mercadante”, “Cilea” e “Premio Ricciarelli. Debutta nel 1992 come Figaro ne Il barbiere di Siviglia a Mantova, un ruolo che interpreta poi in diversi teatri italiani ma anche a Lima, Granada e Bilbao. Artista poliedrico è capace di spaziare da ruoli buffi e brillanti a ruoli più seri. Ha aperto la stagione 2016/17 interpretando i ruoli di Michele e di Gianni Schicchi nel Trittico di Puccini al Opéra-Téâtre di Metz e poi di Don Pasquale al Teatro di Biel/Solothurn. Tra gli impegni della stagione 2015/16 Le Comte Ory (Raimbaud) al Theater Biel/Solothurn e al Theater Winterthur, Germont ne La Traviata al Theater Biel/Solothurn, Mamma Agata ne Le convenienze e inconvenienze teatrali al Teatro Comunale di Treviso, Tonio in Pagliacci – Clowns (tratto liberamente da Pagliacci di Leoncavallo) al Konzert Theater Bern, Pollicino di Henze, ruolo del padre al Teatro Regio di Torino con la regia di Dieter Kaegi e la direzione di Claudio Fenoglio. In estate torna all’Opera da Chambre di Ginevra come Bruschino ne Il signor Bruschino. 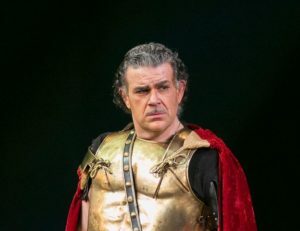 Nel 2014 ha debuttato al Teatro Verdi di Trieste con il ruolo di Ezio in Attila con la direzione di Donato Renzetti e la regia di Enrico Stinchelli. Tra gli altri impegni della stagione 2014/15: Mamma Agata ne Le convenienze e inconvenienze teatrali al Theater Biel/Solothurn, Don Magnifico ne La Cenerentola al Theater Bern, Renato in Un ballo in maschera all’Opera di Metz. Collabora regolarmente con il Theater Biel/Solothurn, dove ha cantato inoltre in Giovanna d’Arco, Stiffelio, La Traviata, Il Barbiere di Siviglia, Luisa Miller, I due Foscari, Lucia di Lammermoor, Il Trovatore e Rigoletto e dove nel 2014 ha debuttato i ruoli di Selim ne Il Turco in Italia con la direzione di Marco Zambelli e la regia di Pierre-Emmanuel Rousseau e Renato in Un ballo in maschera con la direzione di Franco Trinca e la regia di Paul Emile Fourny. Ha cantato inoltre a Palma de Maiorca (Enrico ne Il campanello), all’Opéra di Montecarlo (Le convenienze ed inconvenienze teatrali), a Bari (Così fan tutte), a Ginevra (Le Cantratrici villane di Fioravanti, La Cambiale di matrimonio e Cassandro ne La finta semplice), a Nantes (Don Magnifico ne La Cenerentola), all’Opera di Berna (Germont ne La Traviata e Don Magnifico ne La Cenerentola) e all’Opera di Schenkenberg (Conte di Luna ne Il Trovatore). Michele Govi si è esibito al fianco di artisti come Katia Ricciarelli, Renato Bruson, Luigi Alva, Leo Nucci, Roberto Alagna e Angela Georghiu e ha collaborato con direttori come Evelino Pidò, Carlo Franci e Richard Bonynge e registi come Franco Zeffirelli e Pierluigi Pizzi. Su CD ha inciso Le serve rivali e Il cavaliere errante di Tommaso Traetta, La Serva padrona di Pergolesi e La Frascatana di Paisiello per Bongiovanni. 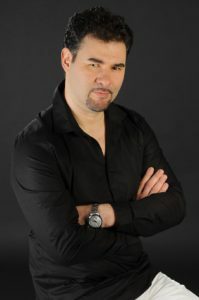 Baritone Michele Govi was born in Bari, Italy, where he also graduated from the Conservatorio N.Piccinni with a Singing Degree. He won the “Mercadante” and the “Cilea” competitions; in the sommer 1992 he took the “Ricciarelli’s prize” for young talented opera singers, which led him to follow masterclasses with Gianni Raimondi, Paolo Washington, Ugo Benelli, Nicolaj Ghiuselev and Paolo Montarsolo. His wide repertoire includes the most important operas of Mozart, Rossini, Verdi, Puccini and composers of the 20th century as Ravel, Rota, Britten, Martinu and Orff among others. Michele Govi regularly performs in many italian theaters (Bari, Como, Bergamo, Cremona, Lecce, Roma, Fermo, Brescia, Jesi, Novara, Trento, Bolzano, Rovigo, Bologna, Parma, Trieste) and throughout the world (Pola, Monte-Carlo, Laudanne, Geneva, Bern, Biel, Lima, Santacruz in Tenerife, Bregenz, Strasbourg, Liverpool, Bergen, Canterbury, Tokyo, Osaka, Nagoya, Palma Di Maiorca, Lisbona, Busan). He collaborated with renowed conductors such as Aprea, Martin, Rovaris, Carminati, Pidò, Andretta, Franci, Bonynge, Renzetti and with famous stage directors such as Zeffirelli, Mariani, Crivelli, Maestrini, Vizioli, Nichetti, Mirabella and Pizzi. Since many years he has been regurlarly invited to perform at the Konzert Theater in Bern (Traviata, Cenerentola), at the Theater of Biel-Solothurn (Don Giovanni, Stiffelio, Giovanna d’Arco, I due Foscari, Trovatore, Rigoletto, Puritani, Macbeth, Ballo in Maschera, Turco in Italia) and at the Opéra de Chambre in Geneva (Frascatana, Le serve rivali, Elisir d’amore, Scala di Seta, I due Baroni, Barbiere di Siviglia, La finta giardiniera). Particular highlights from Michele’s busy concert schedule include “Il Trovatore” of Verdi with the Oper Schenkenberg company “Attila” of Verdi at the Teatro Verdi di Trieste (2014), “Convenienze ed inconvenienze teatrali” of Donizetti in the main role of Mamma Agata in Biel (2014), “Un Ballo in Maschera” of Verdi at the Opéra Théâtre of Metz (2015), “Gianni Schicchi” and “Il Tabarro” of Puccini at the Opéra Théâtre of Metz (2016), “Don Pasquale” of Donizetti and “La notte di un nevrastenico” of Rota at the Theater of Biel-Solothurn (2017). He recorded “Le Serve Rivali” and “Il Cavaliere Errante” of Tommaso Traetta, “La Serva Padrona” of G.B. Pergolesi and “La Frascatana” of Giovanni Paisiello for the label Bongiovanni. Valter Boriné un musicista famoso per la sua straordinaria ecletticità: diplomato in pianoforte e composizione al Conservatorio di Milano, ha condotto parallelamente studi privati per diventare anche Direttore d’orchestra e Cantante Lirico, rendendosi protagonista poi in queste due specifiche carriere. Per un ventennio la carriera del cantante lirico, come tenore di primi ruoli, ha preso decisamente il sopravvento, portandolo ad esibirsi sui più prestigiosi palcoscenici italiani ed esteri in ruoli pucciniani come Cavaradossi i « Tosca », Rodolfo ne « La Bohéme », Calaf in « Turandot », Ruggero ne « La Rondine », Pinkerton in « Madama Butterfly », e in ruoli verdiani come Manrico ne « Il Trovatore », Alfredo ne « La Traviata », il Duca in « Rigoletto », Foresto in « Attila », Radames in « Aida », Riccardo in « Oberto », Rodolfo in « Luisa Miller », Adorno in « Simon Boccanegra ». Suo grande « cavallo di battaglia » é stato spesso il ruolo di Don José nella « Carmen » di Bizet, ma ha interpretato anche Werther nell’omonima opera di Massenet e Renato DesGrieux nella « Manon » dello stesso autore. Il teatro San Carlo di Napoli, il Teatro alla Scala, il Teatro Massimo di Palermo, il Bellini di Catania, Il Carlo Felice di Genova, il Comunale di Bologna, il Lirico di Cagliari, il Regio di Parma, Lo Sferisterio di Macerata, il Teatro degli Champs-Elysées di Parigi, la DeutscheOper di Berlino, la Los Angeles Opera, l’Art Center di Seoul, il New National Theatre di Tokio, l’Opera Nazionale di Pechino, lo Staatsoper di Vienna, il Teatro Mikhailovsky di San Pietroburgo, sono solo alcuni dei teatri nei quali si é esibito. Recentemente la sua carriera, per sua volontà, é tornata ad essere invece prevalentemente quella del direttore d’orchestra: oltre a conoscere un vasto repertorio sinfonico, la sua non comune esperienza del teatro d’opera, unitamente alla sua conoscenza pressoché totale delle problematiche del palcoscenico, lo rendono un direttore ideale per tutto il repertorio del melodramma. Recentemente ha diretto La Traviata e Nabucco al Teatro Ariston di Sanremo, Rigoletto al Festival di Saaremaa (Estonia), Turandot e La Bohéme nei teatri di Chiavari e Imperia, Aida al Teatro « Maria Caniglia » di Sulmona, L’elisir d’amore in Toruné con l’As.Li.Co, Il Barbiere di Siviglia al Festival di Saaremaa e al Civico di La Spezia, ma anche la Messa da Requiem di Verdi al teatro Alfieri di Asti e al Cantero di Chiavari, il Requiem di Mozart nella cattedrale di Santa Maria del Suffragio a Milano, il balletto « W Verdi » a Riga, concerti sinfonici e concerti di capodanno al teatro Alfieri di Asti e con l’Associazione Pozzoli in vari teatri lombardi. E’ stato direttore artistico dell’Orchestra Sinfonica di Asti, ha diretto l’Orchestra Filarmonica Italiana, l’Orchestra Magellano, l’Orchestra « 1813 » della fondazione As.Li.Co, l’Orchestra Filarmonica Pozzoli, l’Orchestra Sinfonica di Riga, l’Orchestra delle Terre Verdiane. E’ direttore principale di « Ritorno all’Opera ». Deutsches Symphonie-Orchester Berlin, Tokyo Philharmonic, Seoul Philharmonic Orchestra and the Scottish Chamber Orchestra. In 2010, Ms. Borsi made her recital debut at London’s Wigmore Hall. She has collaborated with illustrious conductors Riccardo Muti, Zubin Mehta, Lorin Maazel, Myung-Whun Chung, Marcello Viotti, Michel Plasson, Alain Lombard, Marco Armiliato, Yannick Nézet-Séguin, Andres Orozco-Estrada, Pablo Heras-Casado, Carlo Rizzi, Ramon Tebar, Giordano Bellincampi, Enrique Mazzola, Donato Renzetti, Maurizio Benini and eminent stage directors Franco Zefrelli, Hugo De Ana, Damiano Michieletto, Stephen Langridge, Graham Vick, Jurgen Flimm, Pier Luigi Pizzi, Mario Martone, Daniele Abbado, Giancarlo del Monaco, Nicolas Joel and Robert Carsen. Borsi has established herself as a ‘well-rounded’ Artist, having focused as much on the symphonic repertoire as that of the operatic. She enjoyed a long collaboration with Maestro Lorin Maazel (more than 40 performances), specifcally in Beethoven’s 9th Symphony and Verdi’s Messa da Requiem. Other symphonic repertoire include Respighi’s Il tramonto, Poulenc’s La Dame de Monte-Carlo, the Last Four Songs by R. Strauss, Canteloube’s Chants d’auvergne and Mahler’s 2nd and 8th Symphonies. The 2016/17 season will see her in La bohème at the Royal Danish Opera, Contessa in Le nozze di Figaro at the Gothenburg Opera and Liù in Turandot at the Pittsburgh Opera. A highlight of her recent engagements is the opening concert of EXPO in Milan, where she shared the stage with the orchestra of Teatro alla Scala, pianist Lang Lang, soprano Diana Damrau, tenor Francesco Meli and baritone Simone Piazzola. Other highlights include Otello in Oviedo, Verdi’s Messa da Requiem in Moscow and a concert version of Tosca with the London Philharmonic Orchestra. The 2017/18 season will see her in a new production of Don Giovanni by Hugo de Ana at Beijing’s NCPA. Ms. Borsi’s discography includes a live recording of Mozart’s Don Giovanni with Zubin Mehta (Helicon), a live recording DVD of Beethoven’s 9th Symphony with Lorin Maazel (Kultur),* Puccini’s Turandot (Fenice), Bizet’s Carmen with Franco Zefrelli, Peter von Winter’s Maometto II (Marco Polo) and her frst solo album “Italian Soprano Arias” with the London Symphony Orchestra conducted by Yves Abel (Naxos). Born in Sora (Italy), she studied with Antonietta Stella, Lucia Stanescu, Claudio Desderi, and Renata Scotto.